When it come to wine regions, Colorado hardly seems to even get an honorable mention. With places like Italy, Spain, Portugal, Chile, Oregon, California, and France dominating the (wine) presses, Colorado wines often find themselves sulking in the corner, generating grapes of wrath and vines of vengeance. Being new to the industry, Colorado wines find it hard to compete against wine regions that have been famous for decades and, in some cases, centuries. But, that doesn't mean Colorado wines aren't up and coming. In fact, Colorado even has an advantage. Because it's fresh and new, it might just be a little more exciting than those ol' Napa and Sonoma Valleys that we re all used to. How Many Vineyards are in Colorado? With the Colorado wine industry just taking off, it may seem as if vineyards are as sparse as, dare I say it, Denver Bronco wins. But, this isn't the case at all. Colorado wine is created in nearly sixty vineyards across the state. Its mountainous region, which allows for hot summer days and cool summer nights, provides Colorado with an ideal growing atmosphere for highly flavorful, acidic wine. Its altitude, with most growing occurring between 4,000 and 7,000 feet, makes Colorado wine regions some of the highest in the world. What Kinds of Wines Do Colorado Vineyards Make? Colorado wines are nothing if not varied. Popular wines include Cabernet Sauvignon, Cabernet Franc, Chardonnay, Merlot, Muscat, Pinot Gris, Riesling, Sauvignon Blanc, Syrah, and Zinfandel. As is the case with more regions, different vineyards make and specialize in different types of grapes. Colorado vineyards are particularly proud of their Cabernet and Merlot varietals. What is the History of the Colorado Wine Industry? The history of Colorado wines isn't as short as you might think: though these Rocky Mountain grapes are just starting to get their day in the sun, they have actually been around for quite a while. Wine growing is thought to have started in Colorado way back in the 18th century. But, it didn't take off: the wine industry was corked for two reasons. First of all, the climate of Colorado can be tricky: wine can be difficult with the temperature fluctuations of the mountains. Secondly, Prohibition quite literally dampened everybody s spirits. However, Colorado wine saw a resurgence in the 1970 s and has continued to grow, figuratively and literally, ever sense. Have Colorado Wines Won Any Awards? With acceptance speech in hand, Colorado wines have gladly won several awards. These awards include regional, national, and international. From Breckenridge to Winter Park, several vineyards across the state have been lauded for success. Where are the Best Places to Visit to Experience Colorado Wines? As stated above, there are dozens and dozens of vineyards throughout Colorado. 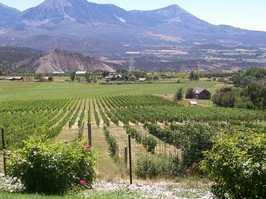 However, to experience Colorado wines at their fullest, Grand Junction and Paonia are particularly popular. Both these places are home to several vineyards and are communities dedicated to the promotion and education of wine. They have exceptional tours, tastings, and classes. Colorado might not be the cornerstone of the wine industry, but as more vineyards pop up and more wineries find acclamation, Colorado wines might just find a mountain of success.